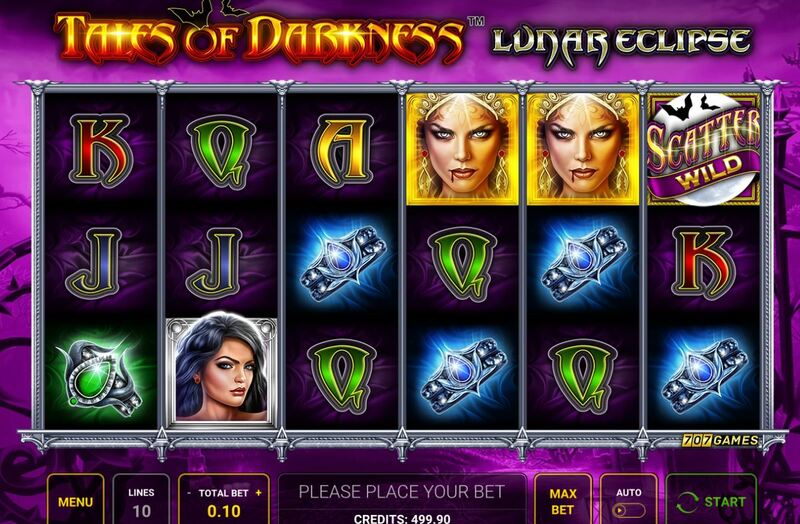 Tales of Darkness Lunar Eclipse slot had me imagining Ozzy Osbourne and bats on the stage when I saw the title graphic but don't worry, there's nothing that outrageous here! We get a Gothic theme instead with dark reels over a spooky nightscape which hints at hidden perils in the moonlight and our main character indeed drips blood from her mouth to add to the atmosphere. If you've seen Nextgen's Blood Lore slot or Merkur's Vampires then you'll get the gist of the graphics and appearance here, all pretty serious and no cartoons! It's a shame the spooky Halloween-style music is so quiet and drowned out by the Novo trotting sounds of the reels, but will Tales of Darkness manage to eclipse our bankroll too? It's pretty unspectacular Novomatic fayre here as far as the symbols go with the usual card values and limited picture icons but what is spectacular is the fact we get 6 reels here! Before your groan though, it's not a Book of Ra Deluxe 6 copy although we do get 10 paying lines as with that game. 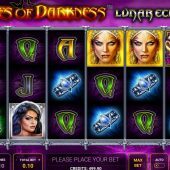 The icons are singles and the scatters do act as Wilds too with 6-of-a-kind wins paying 150 bet for the Vampiress, 100x Princess, 60x for Green or Blue Ring and four card values at either 30 or 20x for the full 6. The free games format though is definitely a new one as we shall discover. You need 3 or more Wild/Scatters to land in view to trigger 10 free spins and a novel mechanic. You will then see a dial with all 8 standard symbols on and one is selected for you. This will then end up being stacked and coloured Gold on just reels 2 and 5 but when landing it will expand sideways in all positions in view. So if the fully stacked Golden symbol appears in view, it will become a giant 3x3 symbol, if it appears just 2-rows high it expands to a 2x3 block symbol. The second enhancement is that if it just appears on reel 5 any wins it offers will pay from right-to-left as well. The idea is obviously to get both reels 2 and 5 with the Golden symbol fully stacked which will award a full screen therefore paying anything from 200 to 1,500x bet depending on which symbol was selected by the dial. yes, it can retrigger too with 10 extra games.